We've been hit with a winter storm here in Tennessee and everything has come to a screeching halt! We don't have enough plows and such to clear away all the snow , so what is normal everyday weather for much of the US.....isn't so normal for us. It is such a treat to see the snow covering everything because it just doesn't happen that much around here, so we appreciate it and we are intimidated by it. So, everybody stays home. We've had a great day cocooning inside except for venturing out for a winter time photo shoot to gather references. I can see the tracks of my fox friend that lives outside of our fence line. I put some leftover turkey out for him tonight. I know my canadian friends are laughing at me right now....but hey....this snow is big news for us :-) ! 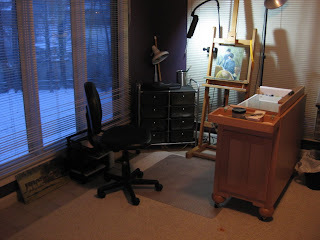 I've also attached a shot of a corner of my studio and you can see the twilight snowy evening out of the window. You can also see my nice new taboret that just arrived a few weeks ago and it really helped my organization in the studio. It is a "Todd Reifers" workstation and so far I really like it. It looks all clean now but I'll probably have it all paint splotched before long. It has storage and a generous sized top for paint mixing. It also has a cover that you can pull up and over your paint overnight and I find that it helps keep the paint from drying out quite so much. So, looks like tomorrow I can enjoy painting and looking out at this winter wonderland..... what a treat.